Valenzuela City, Philippines – May 14, 2015 – Dozens of workers in a suburb near the Philippines capital of Manila have tragically become the latest victims of unsafe working conditions at a fashion factory. 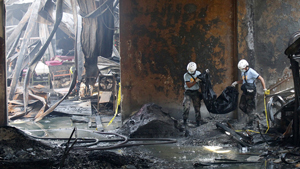 At least 75 workers at a shoe factory in Valenzuela City were killed when a fire broke out Wednesday at the main entrance to the building. The workers inside were trapped, including some by bars on the windows of the facility’s second floor. The bars “could prevent even cats from escaping,” said one of the victim’s relatives. The factory produces fashion flip-flop sandals, and is the latest tragic example of the callous disregard for the safety of workers in many factories supplying the multi-national fashion business. The Philippines fire comes just two weeks after the second anniversary of the collapse of the Rana Plaza apparel factory in Bangladesh that killed 1129 workers, and injured thousands more. In 2013, another 377 Bangladesh apparel workers died in a factory fire, and in 2012, a fire at a fashion factory in Pakistan tragically claimed another 379 lives. "Our thoughts go out to the families of the victims and the injured in Valenzuela City," says Paul Meinema, the National President of UFCW Canada. "There must be no more deaths for fashion, and we will continue to work with our labour allies around the world to make that happen. The Bangladesh Accord has prevented such tragedies from occurring at factories that have signed on in that country," says Brother Meinema, who was a member of a fact-finding mission to Bangladesh to improve safety and working conditions there. "The same type of independent, third-party inspection accord would also save lives in other countries where safety and building standards are considered secondary to profit," Meinema adds.